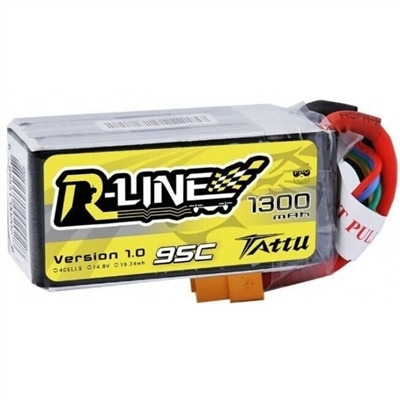 TTattu R-Line 1300mAh 95C 4S1P lipo battery pack What is R-Line? R-Line is a brand new product line specifically designed for professional FPV racing competitions. It's the selling version of Toppilot batteries. It's also a subsidiary of the Tattu brand. It's got higher capacity, lower internal resistance and lower landing temperatures. They are remarkably more powerful than other graphene batteries. Generally, R-Line batteries have the same specs as our popular Toppilot batteries. R-Line is currently in version 1.0. In the future different versions will also be rolled out to meet the needs of different FPV racing competitions. Batteries will be shipped by ground shipping.